Here’s my last post in the pregnancy category for a while! For a week or so before my due date, I had been waking up around 2am with contractions that were too strong for me to sleep through. I would get up, do a hypnobabies script, and then they’d usually die down enough for me to sleep. My husband and I kept joking that she was going to be born at 2am. At 2am the night after my due date, I woke up to go to the bathroom and realized that I wasn’t having contractions. I thought, “Oh well, I guess it’ll be another day.” As I sat back down in bed, I felt a gush. Confused, I went and changed my clothes and went to the bathroom again. A bunch more liquid came out when I stood up, so I changed again. I did this 4 times before I realized that my water had broken. There was a pile of clothes in my bathroom from all of the changes. My water had never broken on its own, and I definitely hadn’t imagined that it would break before labor! I woke my husband up and told him that I thought my water had broken. It kept gushing, so I called my midwife who told me to put on one of the adult diapers in my birth kit – niiiiice. I had my first good contraction a few minutes after my water broke and I realized this was definitely the real thing. I started shaking from adrenaline. I called my parents on the east coast and told them to book a flight ASAP and maybe they could get here in time! My midwife told me to call back later. She said I sounded like “Yay! I’m having a baby!” and I needed to call when I felt like “Get her out!” or “I don’t want to do this!” I came downstairs, posted on GCM, and my husband and I did some final little cleanups before the baby arrived. For the next 2 hours I had contractions that were still very manageable. Around 4:30 they started to become more intense, so I grabbed my birth ball and my ipod and started listening to my hypnobabies birthing day script and affirmations. It felt so good to sit on the ball, listen to the scripts, and lean on my husband and the bed during the contractions. I was so excited that everything was so manageable. I decided to hop in the shower and see if I liked that. I didn’t. I felt really cold all of the sudden and wanted nothing to do with the shower. I told my husband to call my midwife because things were really picking up. I went back to my birth ball, and kept practicing my hypnobabies while the contractions came. My midwife arrived around 5:30 and by then it felt really good to make horsey lips or a low sound during the contractions. I was still using my fingerdrop and hypnobabies. My midwife checked me and I was 5cm. I stayed near my husband and wanted to lie on my side. I felt like my blood sugar was low and I felt a little dizzy. My midwife made me some eggs and brown rice and I felt a little better after eating. By 6:40 the contractions really started to pick up and for a few of them I was having trouble relaxing. I told my husband that I wasn’t keeping myself limp like I needed to, so we moved positions and I started to get concerned that the hypnosis wasn’t going to work. I had him say some affirmations. Around 7:00 my birthing tub was almost full, so I decided to move over there. As soon as I hit the water, my midwife said my countenance changed. I felt so calm. The contractions were really intense but in a way that I could totally handle. They were tight and had a lot of pressure, but not pain. My hypnosis was working again. My body was pushing. Amy (my midwife) checked and said I was a 7. The next few waves were great, but intense. My body kept pushing. I was trying not to push, but I couldn’t control it. I told Amy that I was going to poop and she put on a glove and grabbed the net. I pushed and thought “My goodness, what did I eat last night? !” I pushed a few more times and heard “The head is out!” I guess I didn’t need to poop after all. The assistant midwife arrived just then and scrambled to get things ready. I was in between waves and had no desire to push. I pushed during the next contraction and Sarah was out. I sat there in the pool amazed. 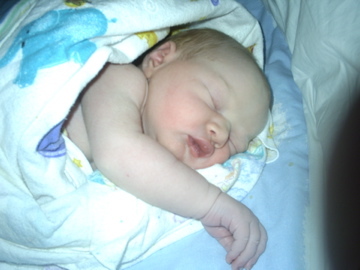 After two complicated births, I had had my beautiful homebirth. It was amazing! We went to my bed after the placenta was delivered and my kids held her after she nursed. My 5yo son cut the cord. It was all so beautiful and peaceful. I still can’t believe it! I had never gone into labor completely on my own, had never gone drug free, had never had an uncomplicated birth, and my body did it all! I’m so proud of body! So wonderful! wonderful to hear a good birth story, to hear a mama who’s happy about it–congratulations and enjoy that baby! Congratulations!! I’m so happy for your family, and even more happy that you had such a wonderful and peaceful birth experience. Welcome, Sarah! What a great birth! And sweet baby in the picture below. Congratulations! Good for you. Natural birth is one of the coolest things I’ve experienced. It took me several weeks to realize it though. Congratulations.